These old GBD’s just seem to follow me home. This one, a Model 357 in Prehistoric finish, wasn’t getting much action on Ebay and I bit. 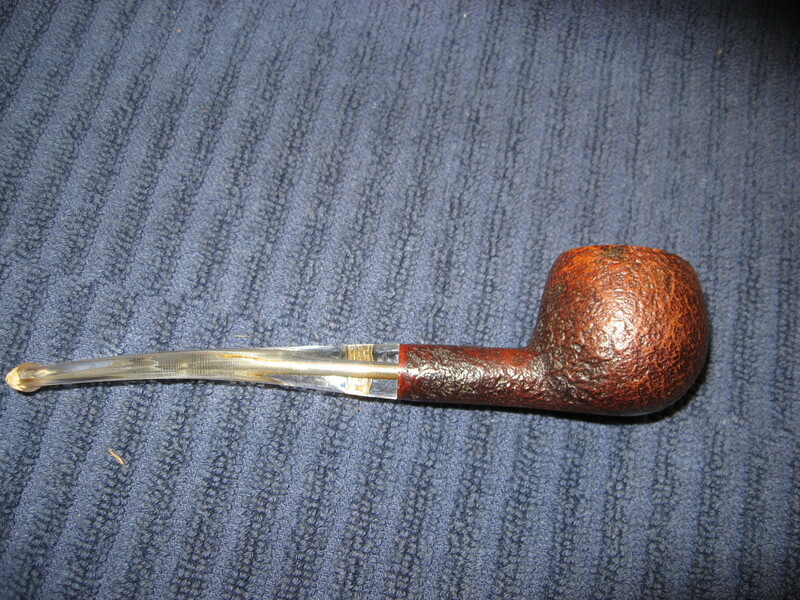 The Ebay pictures showed the briar was in pretty good shape and Perspex stems are generally pretty easy to restore. 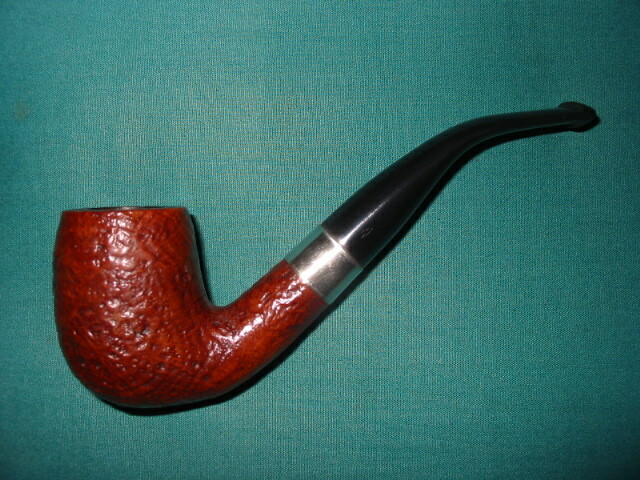 I didn’t have a Prince style pipe in my collection and this one looked like a suitable candidate. I weighed the pipe at 35 grams. That was also appealing and it should be comfortable in the mouth. Using my Castleford tool, I reamed the light cake in the bowl and let it soak with some Sea Salt and Everclear. The Everclear took some of the finish off the bowl top and revealed some scrapes as well. I decided the blast was too nice to leave it in that condition and I knew the nicks on the bowl top would polish smooth. A smooth, beveled GBD bowl top looks great in my opinion and that feature is an attractive aspect of these pipes. While the bowl was soaking, I worked on the Perspex stem. It had a few tooth marks that I was able to sand out starting with some 1500 than 2000 grit wet paper. I than buffed it with the 8,000 and 12,000 grade micromesh pads. I ran some bristle pipe cleaners with Everclear thru the stem. I’d been advised previously to run a dry cleaner thru following the Everclear as to not cloud the stem draft hold of Perspex material. Then, as with the stem, I used some 1500 than 2000 grit wet paper on the polished bowl top, than the last two grades of micromesh. Next up, re-staining, which is still a little nerve-wracking to me. 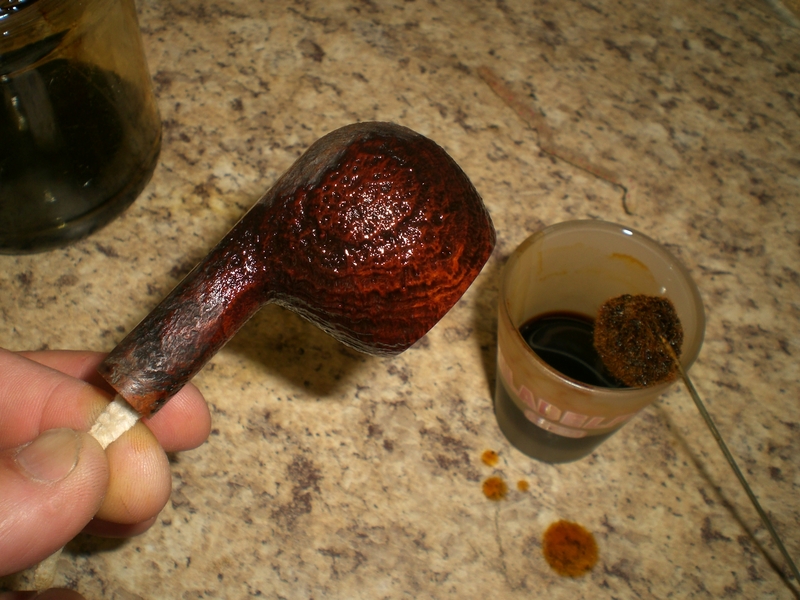 I reviewed Steve’s past blog entries on re-staining a bowl. I had previously completed that step only two other times. I soaked the bowl in a small container of isopropyl alcohol for several hours. I used an old brass bristle brush to help remove the stain and any wax. Than, I let it soak for another few hours. Once the finish was removed, I prepared to re-stain it. I really liked the light brown factory finish and used some Fieberlings Medium Brown stain, but thinned it considerably. On my first two re-stain jobs, my finish came out too dark. This time, I nailed it and the color is just what I desired. I used the dauber supplied by Fieberlings to apply the stain, held by a bent pipe cleaner. After the first coat dried, I applied a second coat. This time I set the stain with a flamer from a lighter. 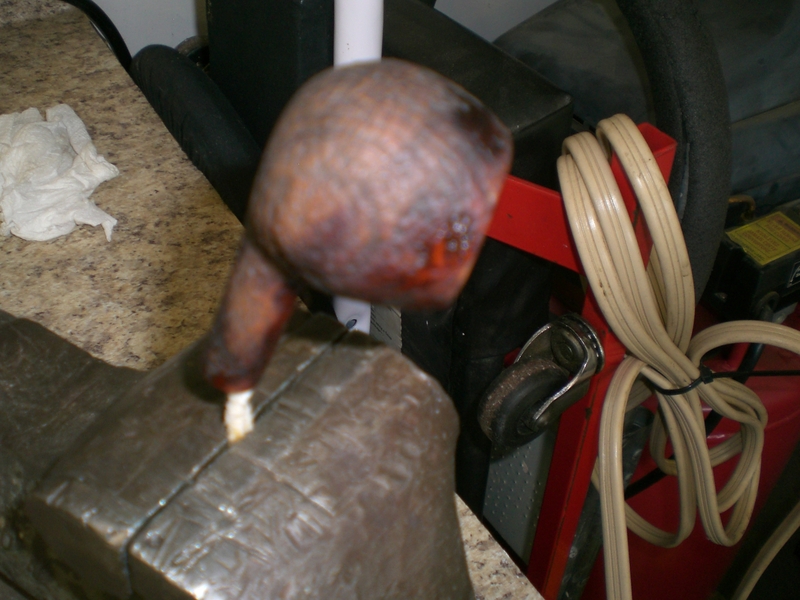 Be sure to not have the pipe sopping with stain, as that burns too long and could leave a burn mark on the briar. The final step was a hand polish with Halycon wax and she was ready to smoke. I’m dedicating this one to Orlik’s “Golden Sliced” blend, which is a good smoke in the hot summer months of Maryland. This entry was posted in Pipe Refurbishing Essays and tagged Bowls - refinishing, cleaning a sandblast finish, cleaning perspex stems, preparing a bowl for staining, removing tooth chatter from perspex stems, restaining, sanding setup, sanding the rim, staining, staining the rim, topping a bowl on June 25, 2012 by upshallfan. I had this old bowl in my box that just looked like a Barlings. I took it out and studied under bright light and a loop. It had the arched Barlings over Make. The other side was stamped EL and Made in England (I believe). It had a serious crack in the shank so I superglued it and banded it. This little pipe became the definition of frustration for me. It was a beautiful and I was incredibly hopeful when I cleaned it up and prepared it for the new stem I had cut for it. 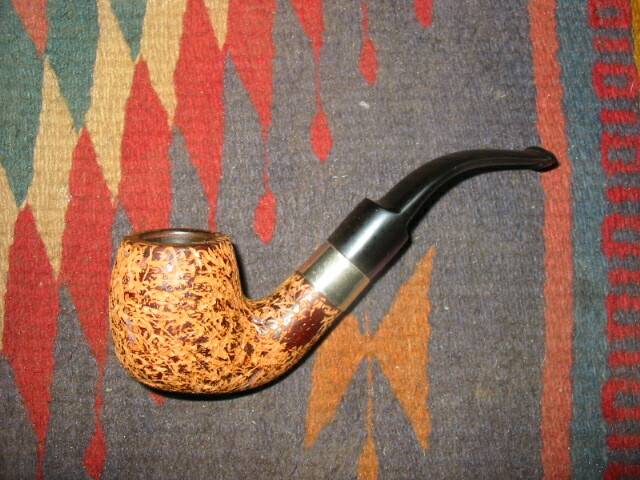 The grain was very nice and to find that it was an older Pre-transition Barling’s pipe was exciting. The bowl cleaned up very well. The shank and new band looked great. All that remained was to finish working over the stem for it. About that time my wife came down to the basement where I was working on it and we decided to go for our Saturday morning walk about. We had planned to take the bus down to an area we like to visit and check out the antique shops. This is something that we both enjoy so I put the little Barling’s my pocket and brought along some sand paper to work on it while sitting and waiting for the bus. We had a good morning, went to the Vancouver Flea Market and even found a couple of older Peterson pipes that I picked up. We decided to have some lunch before going home so we walked over to a nearby Korean BBQ and ordered a nice lunch. While we were waiting for our lunch I guess the pipe fell out of my pocket. I did not notice until the waiter stepped on something and I heard a crack. Well the long and short of it is when we sat down to lunch it had fallen out of my pocket and when the waiter stepped on it the shank cracked off just ahead of the band. I had a sick feeling as I picked up the pieces of the broken old timer. 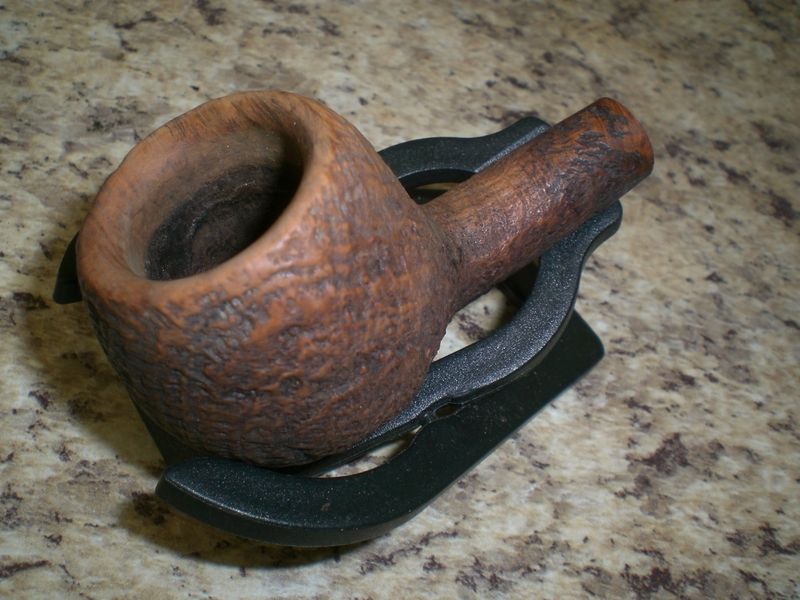 My visions of a nice older Barling’s Pot shape were pretty much crunched. I put the pieces on the table and looked them over as we continue to wait for the meal and I grumbled about my stupidity in not zipping the coat pocket and also about bringing it with me in the first place. Once we had finished eating and headed home I had calmed down enough to think about what I would do with the pipe. I took the pieces to the basement work table and turned on a bright overhead light so that I could examine the damages. As I looked at the broken shank I could see that the wood was darkened, almost burned around the crack. It was almost as if the heat in the shank had found a flaw in the briar and followed it outward to the surface. It had not gotten all the way to the surface but was just under the outer layer of the finish. So it appeared that the crack was worse than I had imagined. That helped me to get over being incredibly frustrated and disappointed in the broken shank. So I spent some time looking it over and decided I could work with it. I decided to turn it into a nose warmer. The saddle stem I had made was too small in diameter to fit so I had to cut another stem. I cut off the ragged edges of the break and used a piece of sandpaper on a solid board to face the shank again. I also drilled out the shank and opened it up enough to accept the new tenon. The tenon is a bit shorter than normal 5/8″ to allow a little difference between the opening in the bowl wall and the mortise. I re-banded the shank for a second time to strengthen the shank after the previous break. I fit the stem to the pipe and sanded and polished it to a shine. 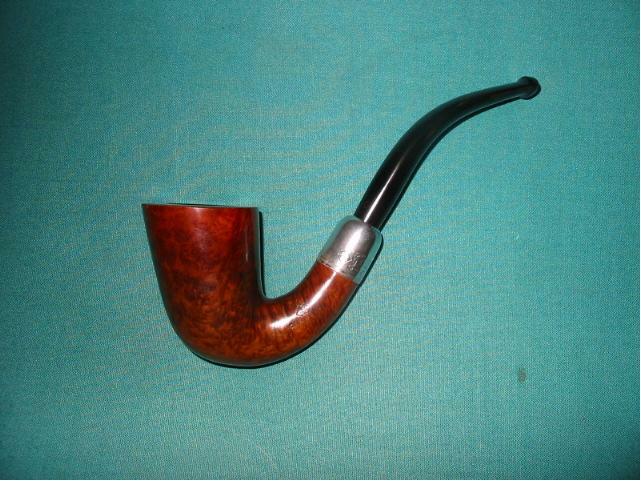 Then I buffed and waxed the “new” little pipe. I made it such that I can one day put a church warden stem on the bowl should I desire to do so. For now though it is a nose warmer with a short taper stem. Total length is 4 3/4 inches. 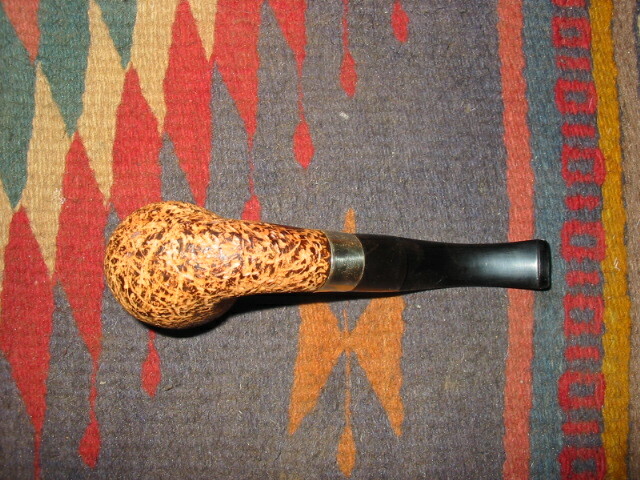 Here are some pictures of the finished pipe. I had pictures of the pipe before and after the break but somehow they were erased so this is all I have left to show. I hope you can imagine what it looked like with the new saddle stem before it broke. But if not, you can see the new version. 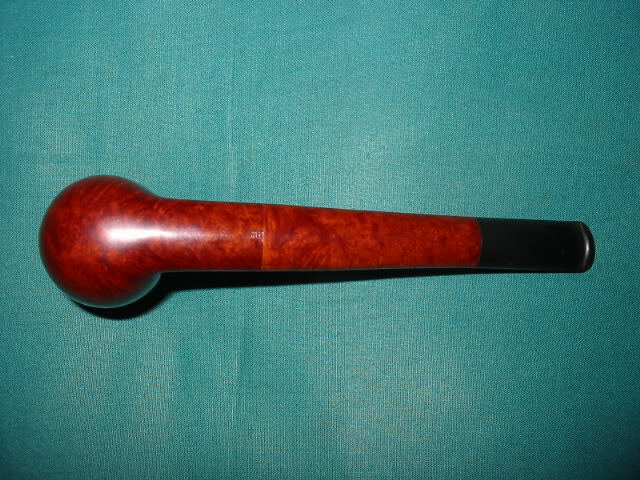 I am also ordering a churchwarden stem for it so I can fit one of those to it as well. Should look great that way as well. 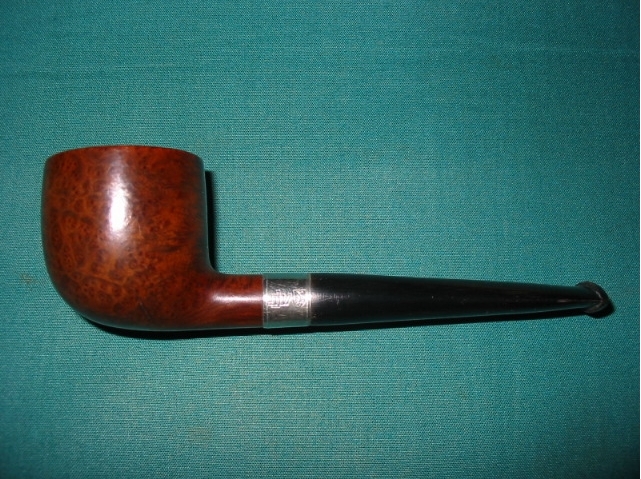 This entry was posted in Examples of Refurbished Pipes, Pipe Refurbishing Essays and tagged Bands, Barlings pipe, Bowls - refinishing, Cracked Shank, cutting a tenon with a PIMO tenon turning tool, fitting a stem, pressure fitting a band, redrilling the mortise in the shortened shank, refinishing a briar bowl, removing a broken shank, removing an old finish, restaining, restemming, shaping a stem, shortening a broken shank on June 23, 2012 by rebornpipes. 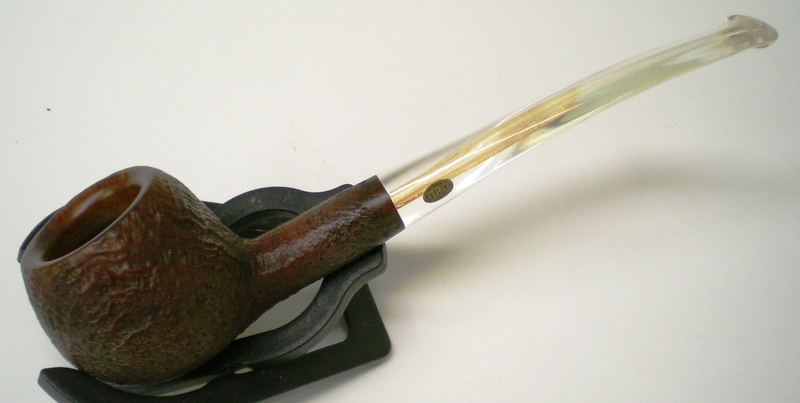 This older BBB Diamond Shank billiard was a pleasure to bring back to life. I love the older BBBs and this one has a place in my collection. It is only stamped BBB in the diamond on both the shank and the stem. There are no shape numbers of other features. I have no idea on what its age is but love the shape. 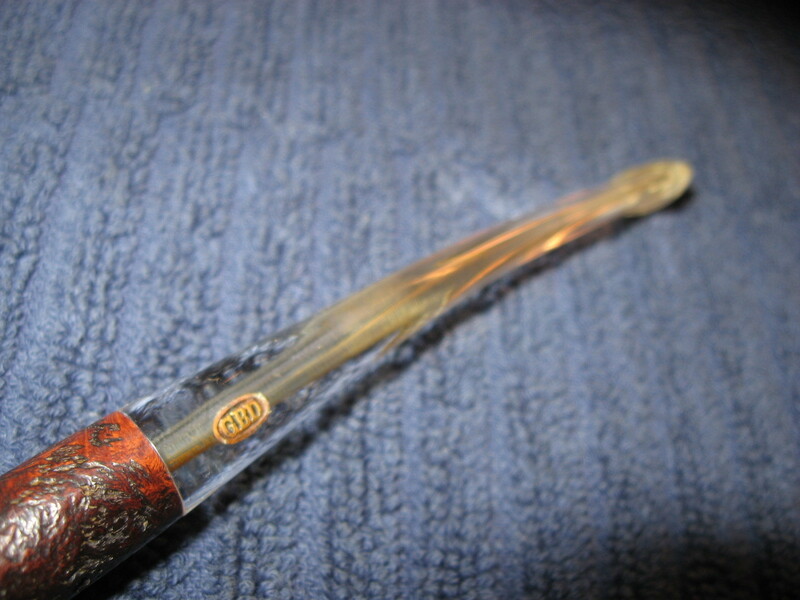 The diamond shank and the way it flows into the bowl make it a unique among my BBB billiards. 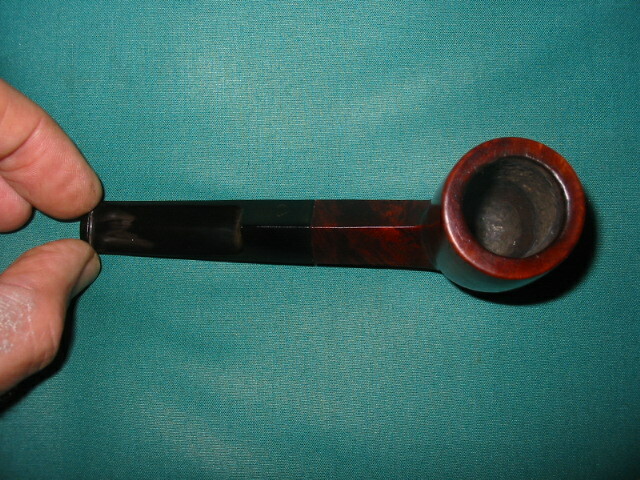 It is stained in a rich oxblood colour and it is a clean little pipe. When I picked it up off EBay it appeared to be pretty clean other than a bit of oxidation on the stem. Sure enough, when it arrived it was very clean. The bowl only needed a slight ream to be ready to smoke. I wiped down the outside of the bowl with a damp soft cloth dipped in Murphy’s Oil soap lightly so as not to disturb the finish but remove the grime. The top had some darkening and tar that came off easily with the Murphy’s Soap. I coated the bowl with several coats of carnauba wax and set it aside. To deal with the oxidation on the stem I sanded it with 400 and 600 grit wet dry sandpaper dipped in water to give it a bite. I finished that with micromesh pads – 1500, 1800, 2400, 4000 and then I took it to the buffer for Tripoli and a bit of White Diamond before giving it several coats of carnauba wax. It has a wide open bowl and draw. This entry was posted in Examples of Refurbished Pipes, Pipe Refurbishing Essays and tagged BBB brands, BBB pipes, Bowls - refinishing, cleaning a finish, pipe refurbishing, polishing bowls, polisihing stems, removing oxidation from a stem, repairing tooth marks, sanding stems, waxing a bowl, waxing stems on June 20, 2012 by rebornpipes. I have spent a bit of time on this old Croydon Bent (Peterson Line of seconds I believe). In fact I probably spent more time than I should have done, judging by other refurbishers throw away buckets. Sometimes I just have to see what I can make of an old tired ugly looking pipe. It is a challenge more than it is a labour of restoration. In fact it could probably be argued that when I am done with this one it really no longer should be considered a Croydon at all. I suppose it is a matter of how far one goes in the process of restoration before it becomes a totally new work of briar. In my mind this one would probably qualify for the removal of the name – or at least a hyphenated name CROYDON-REBORN. When I received this one it was in pretty rough shape. In the pictures below you can see the state of the finish on the bowl. There were places where pieces of the lacquer finish were peeling away and falling off. The stain on the bowl was spotted and variegated. Even the many fills all over the bowl had shrunken significantly and what remained were dips and divots in the surface. The rim was one part of the pipe that was in pretty good shape. It had some tar build up and a bit of blackening but no nicks and dents. That is actually remarkable given the condition of the rest of the pipe. The silver shank cap was split in half and torn from the stem being jammed in and out of the bowl. 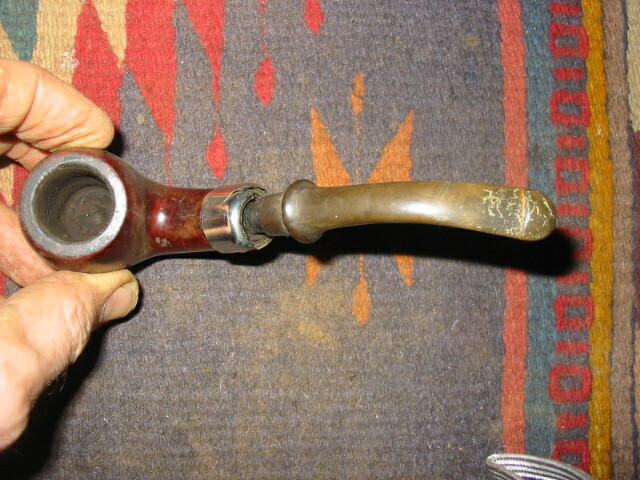 The P-lip stem was also marked with tooth chatter, was oxidized and dented. I did not have any end caps in my collection of pipe odds and ends so I decided to put a regular nickel band on the shank as it was thin and weakened from the broken shank cap. I cleaned the shank end with alcohol and dried it out. I heated a band and pressure fit it on the shank. There was a small gap at the edge that I filled with wood glue to give stability to the shank. I probably should have waited to apply the band but the shank seemed fragile and I wanted to stabilize it before further work on the bowl. I have never liked the thin Peterson type stems so I decided to restem it with a saddle fish tail stem. I used my PIMO tenon turner and turned the tenon close and sanded it to a good tight fit. I used my Dremel to take down the excess diameter of the stem and worked on the ridges and seams with the Dremel. I sanded the roughness of the new stem until it was smooth with 240 grit sandpaper followed by 400 and 600 grit wet dry sandpaper and a bit of water. It was finished with the regular regimen of micromesh pads – 1500, 1800, 2400, 3200, 4000 and 6000 grit. The final polish was done on the buffer with White Diamond and carnauba wax. The bowl was a major problem. I tried to strip the bowl using acetone and 99% Isopropyl alcohol and could not break through the finish – don’t what they coated it with but it would not let go. I resorted to sanding the bowl to try and remove the finish and sanded, sanded and re-treated it with acetone and alcohol. 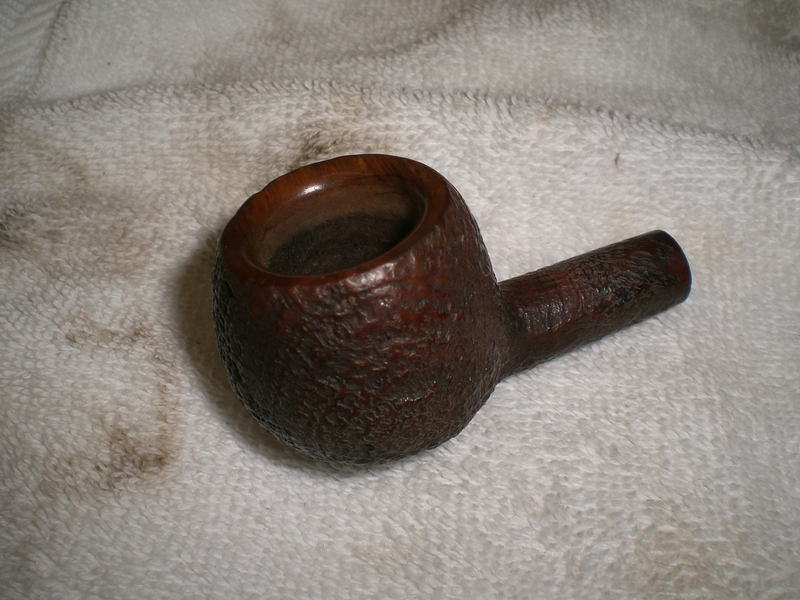 The finish was finally gone and I had a raw briar bowl with so many fills in it that it looked like it had freckles. I decided to try staining it with a dark brown stain to hide the fills and give it a good deep colour that was a bit opaque. Once it was dry I buffed it and polished it with wax. It looked really awful and I hated it!!! Soooo… I decided to rusticate it. I used my fist full of nails (pipe with nails inserted in it) to do the rustication that appears in the photos below. The previous coat of stain that I had applied helped with the process of rustication and I could clearly see where I needed to do a bit more work. This is when I wished that the band was not present as it would have been a bit easier to avoid contact with the band and the rusticator. 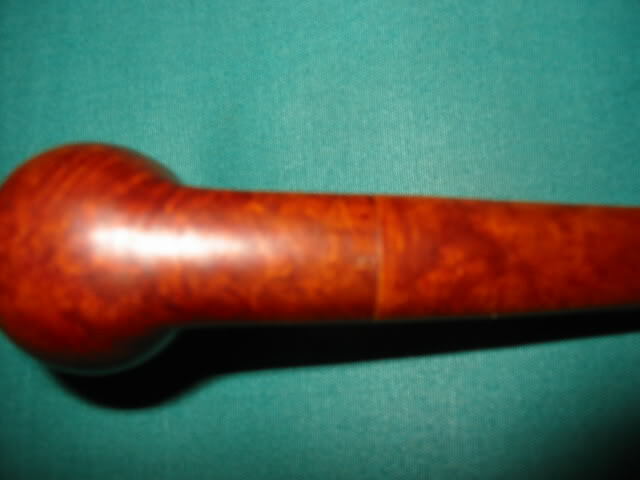 Once the rustication was acceptable to me, and the pipe felt good in the hand I prepared it for staining. On this one that involved using the floral frog to knock off any loose chips of briar and to smooth out the surface before I wiped it down with a damp alcohol cloth. I also sanded the rim smooth and used the micromesh to get rid of any scratches. 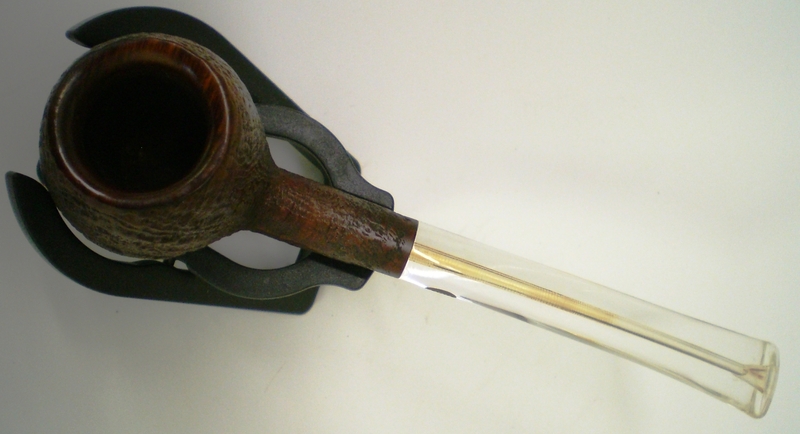 A smooth rim and a smooth spot around the Croydon stamping would look good on the finished pipe. 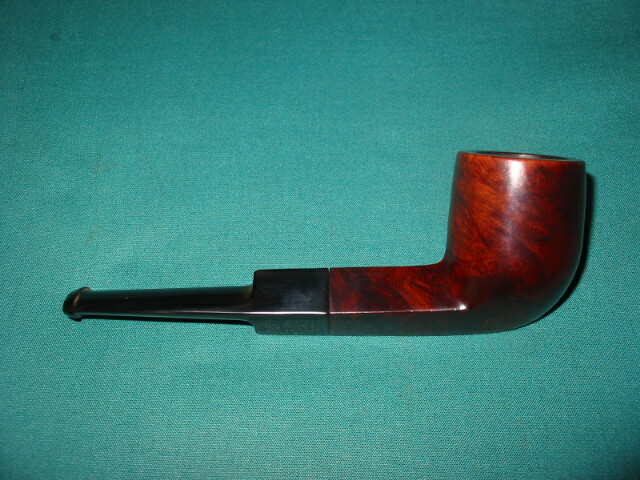 I decided to go for an aged leather like finish on this pipe as it seemed to fit the shape and the look. 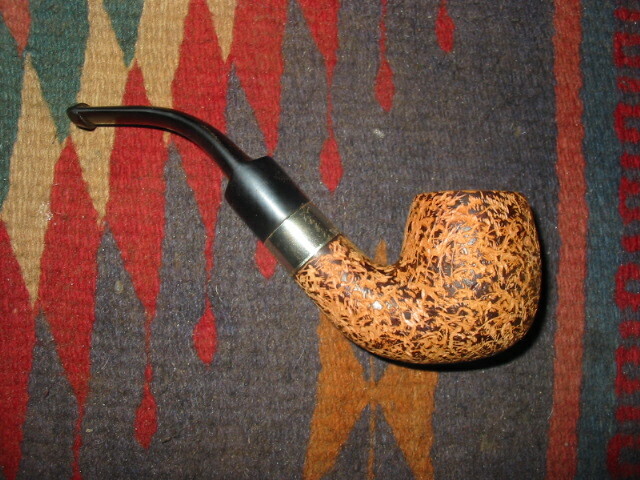 I gave the pipe a coat of black stain as an undercoat and then buffed it off the high spots. I gave the entirety a coating of Fiebing’s Medium Brown for the top coat. I flamed it and after drying took it to the buffer for a light buff. I waxed it with Halcyon II and buffed it with a soft cloth to give it the final look. 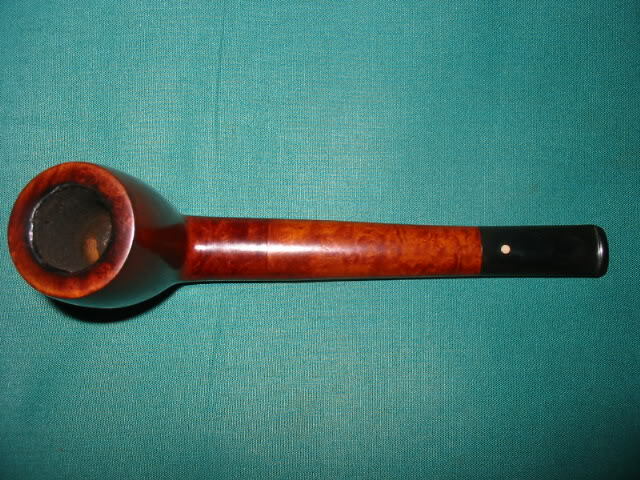 Below are pictures of the finished pipe. In my book it is a significant improvement over the original! This entry was posted in Examples of Refurbished Pipes, Pipe Refurbishing Essays and tagged banding a shank, Bands, bending a vulcanite stem, Bowls - refinishing, fitting a stem, polishing a rusticated bowl, polsihing a stem, pressure fitting a band, restaining, restemming, rustication method, rustication techniques, rustication tools, sanding and polishing a stem, shaping a stem, staining a rusticated bowl, turning a tenon with a PIMO tenon turning tool, using a heat gun to bend a stem on June 20, 2012 by rebornpipes. 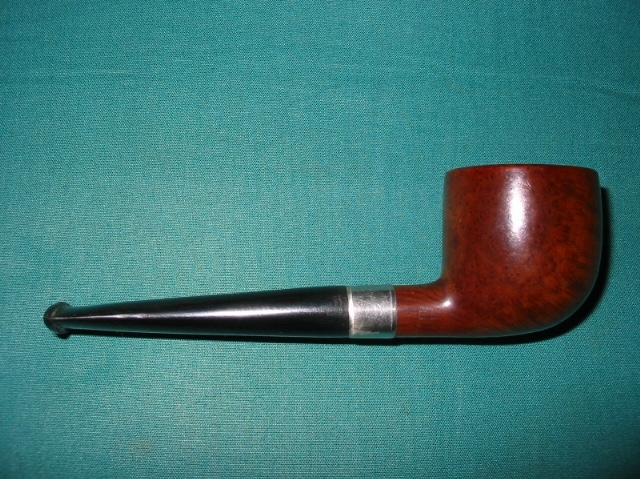 This One is a Mystery Pipe – Is it a ?Dunhill? You will notice from the title of this blog piece that the Dunhill title is framed with question marks. The pipe is a mystery to me all the way around. There is nothing straightforward with it in terms of stamping or composition. It is composed of three distinct pieces (stem, shank and shank/bowl) that have been joined together at some point in the pipe’s history. From the pictures below you can see the junction of the bowl and the shank. 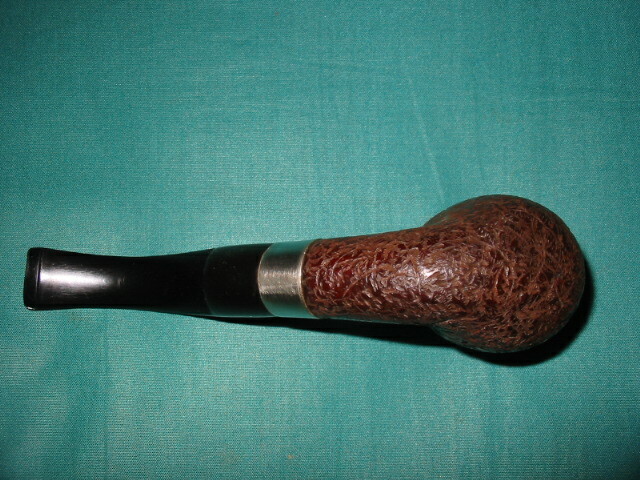 The stem on the shank is a white dotted Dunhill stem. How did this pipe come to be and how did it incorporate at least two different pipes? It would be great if this old timer could tell its story because I am sure that it would be an interesting tale. Did the original owner break the shank on his pipe and then have a repair man do the fix? If so, did the repairman use a second pipe shank to add to the bowl for the repair or did the original owner take two of his pipes (both broken) and have them put together in this creative fashion? Did he take the bowl from one and the longer shank and stem from another and join them to form a new third pipe? 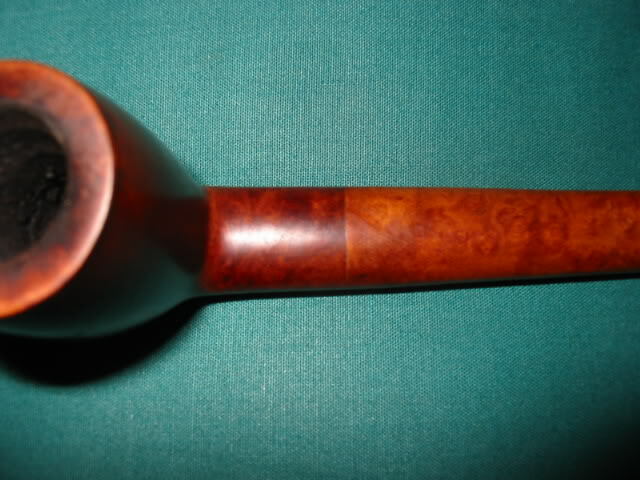 Was the original of both pipes a Canadian or was the one that the bowl came from a billiard? I don’t think I will ever know the answer to those questions and even others if I took the time to think it out. But I do know that this is part of the pleasure I derive from working on estate pipes. I enjoy trying to put together the story of an old pipe. I picked this one up from EBay. I was the only one bidding on it. 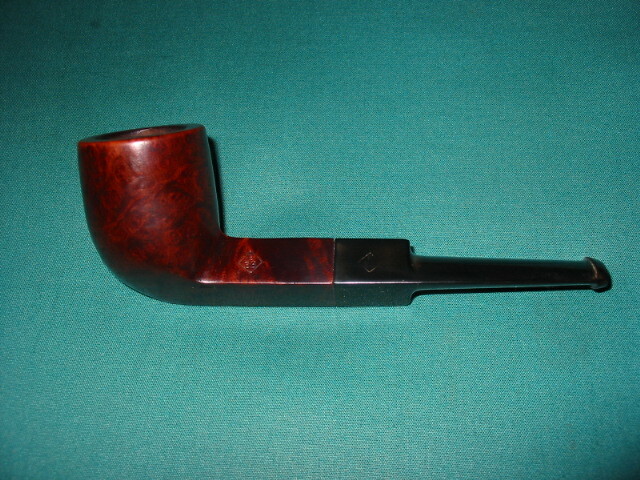 I think the seller had marked it a Dunhill Canadian for sale so it had many viewers but no other bidders. 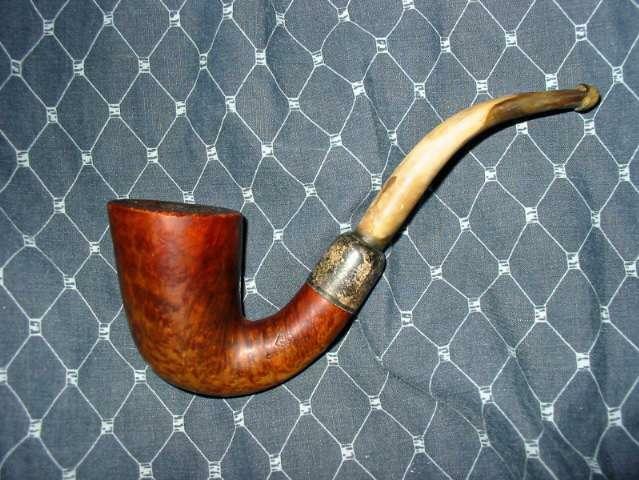 I knew from a quick look at the pictures the seller provided that it was probably not a Dunhill. 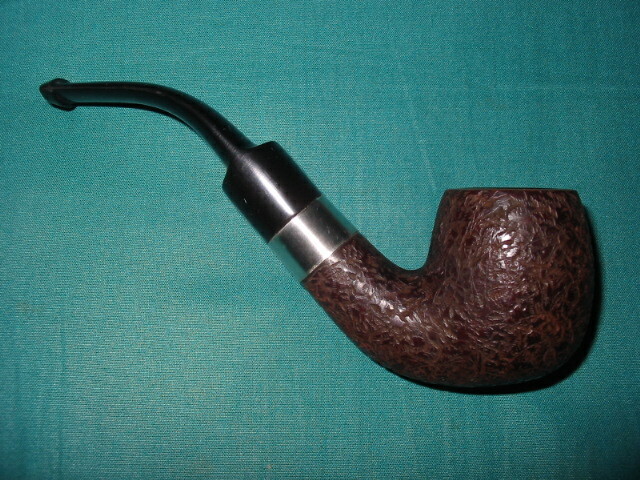 I could not be certain but the shape of the bowl did not quite measure up to other Dunhill Canadians that I have and the flow of the stem and bowl was different to my eye. Others may be able to point out other inconsistencies that they see but that is what I felt as I looked at the pipe. What caught my eye though and caused me to put in a minimal bid were the shank construction (reconstruction) and the flow of the pipe. I liked the looks of it. I was also curious to see how it was done. It looked like a well done repair, if indeed it was one. I wanted to see it close up and study it. 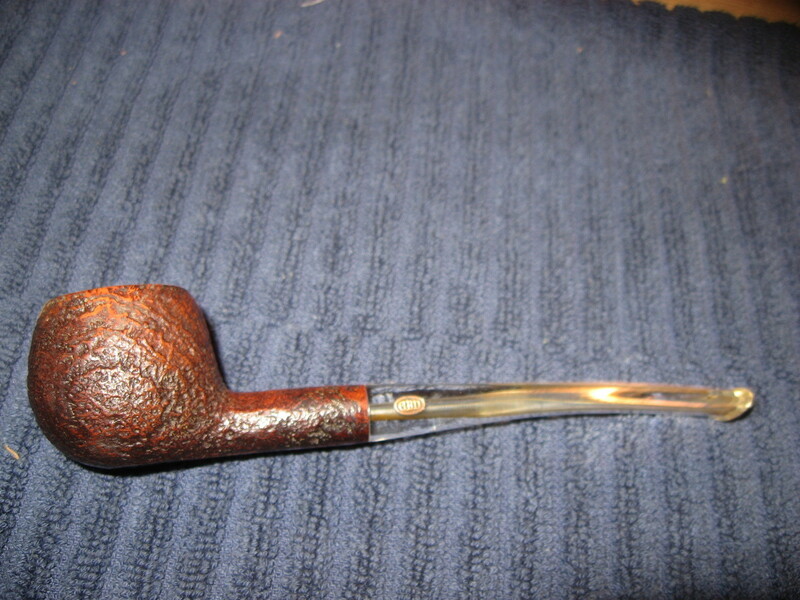 The white spot on the stem was a bonus though I could see from the photos that it was not likely a Dunhill. When it arrived I took it from the box and did a quick field dress cleaning of the pipe. Reamed the bowl, wiped down the outside with an alcohol damp cloth so that I could see the stamping or remnants of stamping that remained. 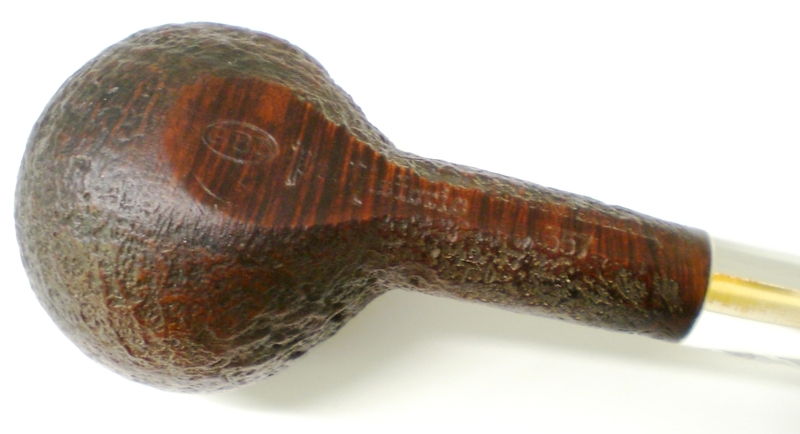 The bowl portion (the section from the front to the union on the shank) has stamping on the bottom of the shank that looks to be what remains of a Sasieni stamp or at least the last few letters “ieni”. That is a bit mysterious to me in that the other Sasieni Canadian I have has the stamping running in the opposite direction. So my guess is that this one is upside down – not unheard of but interesting nonetheless. 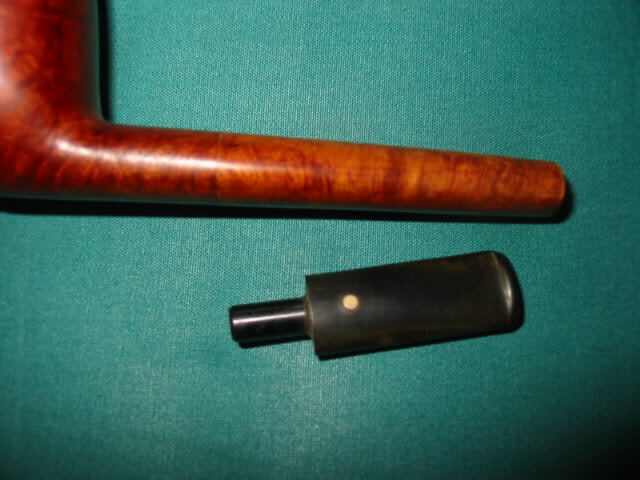 The shank and stem portion (from the junction backward to the stem) are definitely from the same pipe. The fit of the stem to the shank is absolutely perfect with no sanding or shaping marks, no gap and no change of profile to the stem. Under a bright light is possible to make out faint stampings on the shank remnant – and I do mean faint. They appear to be the last four letters of Dunhill – “hill” and under that there are the four letters “land” which could be then end of the word England. 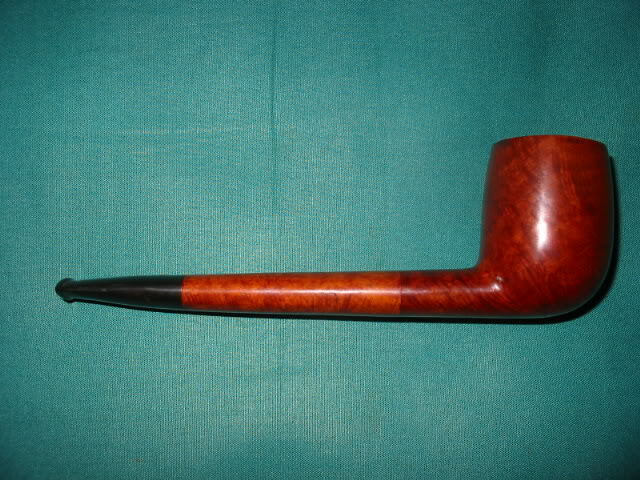 From that I would conjecture that what I have is a combination of a Sasieni and a Dunhill pipe. 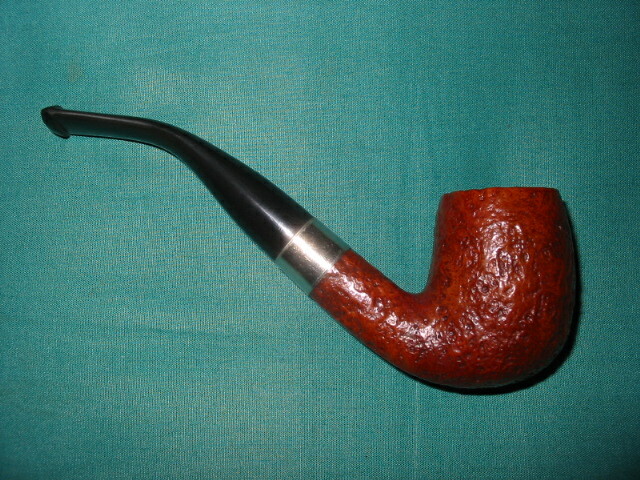 The Sasieni contributed the bowl and part of the shank and the Dunhill the rest of the shank and the stem. Whoever did the union of the two old pipes did a superb job as the joint is very well done. The grains of the two parts of the shank are very different and the staining does not match. But other than that it is a flawless union. With the mystery still unsolved I went to work on the ?Dunhill?/Sasieni. I gave it a better reaming and also cleaned it. The bowl had been very caked when I initially cleaned it so I did a deeper reaming taking it back to the wood. It had a very heady smell of Lakeland style tobaccos so I wanted to remove the remnant of that in the cake and prepare it for the tobacco that I would smoke in it. The shank and stem were tarry and restricted by the gunk inside them. I used a shank brush and many pipe cleaners to clear out the airway. I also tried to shine a light down the bowl to see if there was any evidence of how the repairman had done the union of the shank pieces. But the light would not shine that far down the shank. From the ease with which the pipe cleaners slid down the shank and the smoothness of the airway it was clear that the job was very well done. I also used a drill bit on my KleenReem reamer and ran it through the shank with no catches. Obviously this was a favourite pipe for the previous owner. It was well cared for, repaired and put together and well smoked. I cleaned it with Isopropyl 99% and then sanded out the tooth chatter on the mouth piece. I wiped down the bowl and shank with undiluted Murphy’s Oil Soap and scrubbed it with a tooth brush. It removed the grime from the bowl and the rim. Once dry I cleaned off the remaining lava on the rim with 400 and 600 grit wet dry sandpaper. Once the bowl and shank were clean I wiped the entirety down with acetone. I wanted to get as much of the stain out so that I could try to get a bit better match on the two parts. I re-stained it with a cherry stain I have in the shop as it seemed likely that it was that colour from what was under the grime. The union of the two is still very visible even with a re-stain. The two parts took the stain very differently. I finished by buffing it with Tripoli and White Diamond before giving it multiple coats of Carnuba wax. I am happy with the results. I have smoked it quite often since the refurbishing and find that it is a great smoker. It is lightweight and comfortable in the mouth and the hand. The only thing that would make it even better in my opinion is to have the whole story behind this pipe. 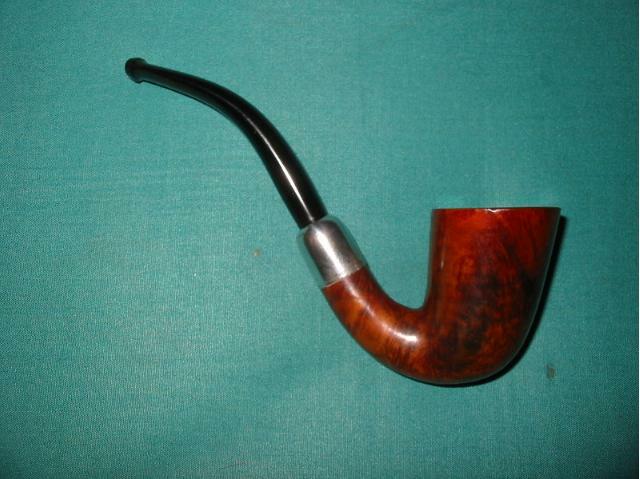 Ah well… I am going to go and fire up a bowl of good Virginia and enjoy adding my story to this pipe. 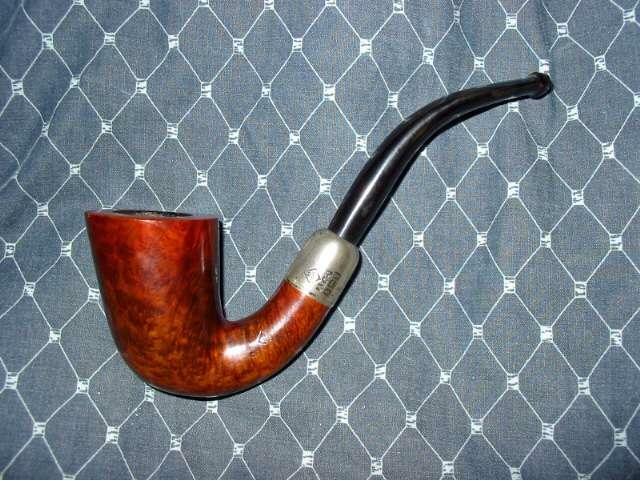 This entry was posted in Examples of Refurbished Pipes, Pipe Refurbishing Essays and tagged Bowls - refinishing, micromesh pads, Oxidation, polishing, removing tooth marks from stems, staining, stem work, vulcanite, waxing on June 18, 2012 by rebornpipes. I was going through some old pictures on my hard drive the other day and found this one that I bought on EBay for a very reasonable price early in 2008. I finished refurbishing it in March of 2008. It was and is one of my favourites. You can see from the picture below what kind of shape it was in when I got it. In the pictures on EBay it looked worse than it does in the picture below. I opened the box when it arrive expecting far worse. 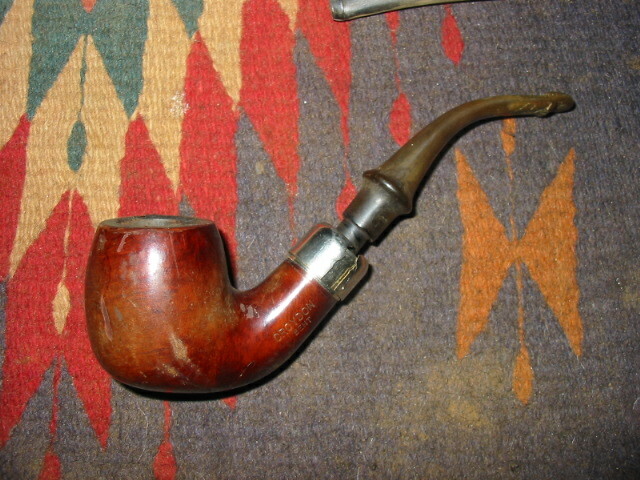 I bid on it because I liked the shape of the pipe and I figured it would be a challenge. The stem was oxidized to the brown white coloration that appears below. It almost appeared to be a horn stem – but it was not. When I removed it from the shank – which took a bit as it was stuck by the goop in the shank and the oxidation that portion was black. I put it in the freezer for a short period of time to cause some expansion and contraction in the stem that would loosen it from the shank. When I took it out of the freezer it was easily removed. I went to work on the inside of the stem with shank brushes and pipe cleaners, both bristle and fluffy dipped in alcohol. I worked on the stem until the cleaners came out white and clean. I then mixed a batch Oxyclean and soaked it in the solution overnight to soften the oxidation. I find that the Oxyclean solution (warm water and a half scoop of Oxy in a pint jar) works wonders in softening the oxidation. It does not remove it but it made it easier to remove. Once I took it out of the solution the next morning to work on it I used 240 grit sandpaper to remove the oxidation. It worked well to take off the brownish white coating on the stem. Once that was finished it was a dull brown and I continued to work on it with the 400 grit wet dry sandpaper until it was a dull black. I then progressed to 600 grit wet dry sandpaper to further remove the grime. I used both of these sandpapers with water as I find it gives the grit more bite on the stem. I had not discovered micromesh at this time so I used 800 and 1000 grit sand paper and continued to sand the stem clean. By the time I used the 1200 grit wet dry sandpaper the stem was looking like new. I took it to my buffer and used the Tripoli and White Diamond to finish the job. 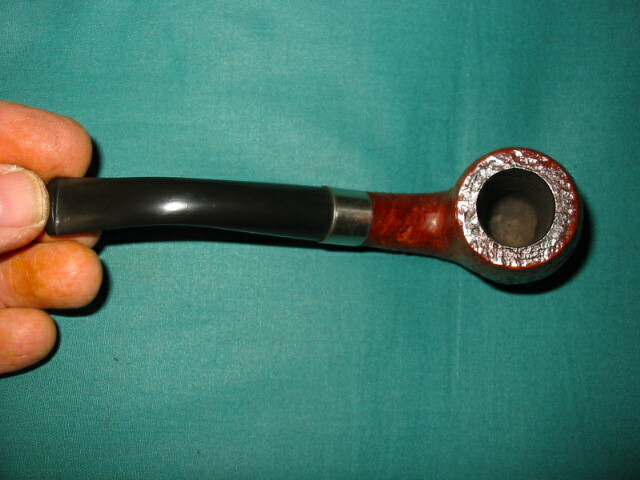 While the stem was soaking in the oxy I reamed and cleaned the pipe bowl and shank. I worked on it until the pipe cleaners came out clean. It took many bristle cleaners and many fluffy one to get it clean. I also used cotton swabs in the shank to remove the tars and build up there. I scrubbed the outside of the bowl and rim with Murphy’s Oil Soap to remove the grime and deep seated dirt on the bowl. After I finished the scrub and clean I put the bowl in a bath of Isopropyl alcohol to remove any remaining dirt and grime and the badly damaged finish on the bowl. That was the first night of my working on the pipe. I went to bed that evening with both the bowl and the stem soaking in their separate baths. The next morning I finished up the stem and set it aside as I described above. I turned my attention to the pipe bowl. I removed it from the alcohol bath and dried it off. I used a wet cloth and a butter knife heated over a flame to raise the dents in the outer rim of the pipe and the sides of the bowl. The process is quite simple. You wet a cloth, wring it out so it is not dripping wet yet still wet. Then fold it and put it over a dent. Heat the knife (I use our gas stove to do it but have also used an alcohol lamp). I then lay the flat blade of the knife on the dent. You will hear a hiss as the heat causes steam to rise from around the blade. The steam causes the dent to rise. I applied the blade repeatedly until the dents were minimized. Then I took it to my work table and used a flat board and a piece of sandpaper to top the pipe just enough to remove the remaining dents and damage. I do that on a flat surface to maintain the flatness of the rim without changing the angle. When that was finished I wiped down both the bowl and rim with an alcohol damp cloth to remove any residual sanding dust. I then used an aniline stain, in this case medium brown as I had researched and found that the colour matched the colour of the pipe when it was new. 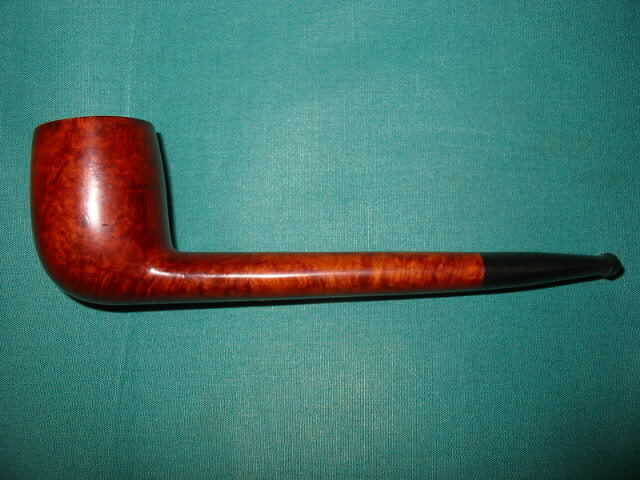 I used the dauber that came with the stain and applied it to the rim and the body of the pipe. I started at the bottom of the bowl and worked my way up to the rim. The rim always the last part I do. Once it was completely covered with stain I ignited it with my lighter to set the stain. The process is called flaming the stain (at least that is what I call it.) I let it dry while I put a coat of wax on the stem. When the stain was dry I took the bowl to my buffer and gave it a buff with Tripoli and White Diamond to remove the top coat of the stain and the opacity of the stain. The result can be seen in the picture below. I also used some silver polishing compound applied with a soft cloth to remove the tarnish on the end cap. I finished that process with a silver polishing cloth to give it a good shine. 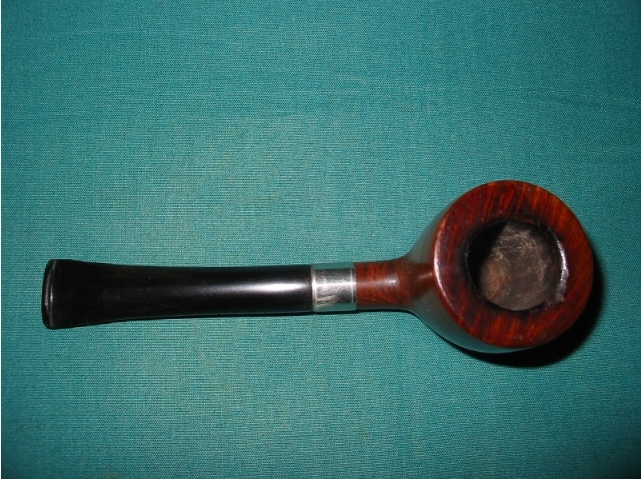 When that was completed I gave the bowl and cap a good buff with carnauba wax then reinserted the stem and gave the entire pipe an extra coat of wax for a finish. I still smoke it today and it delivers proudly! The last two pictures below show what the pipe looks like today after 4 years of use. It has developed a deep patina to the bowl and the warmth of the medium brown stain has mellowed into a richness that is really nice. Repeated waxings over the years have helped mellow the finish and also deepen the black of the vulcanite stem. 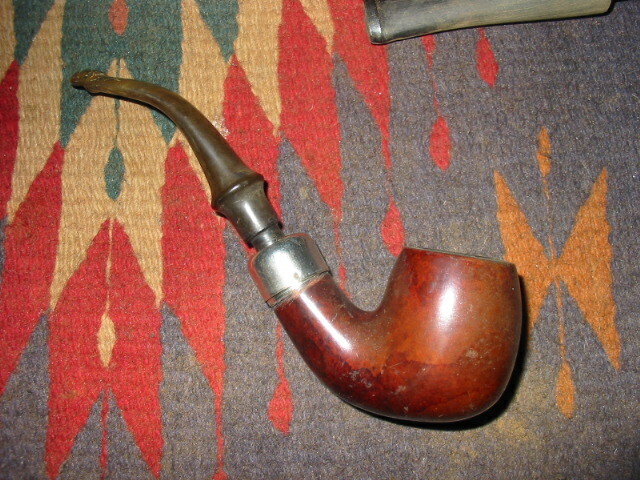 This is one of my favourite old pipes. It truly is a reborn pipe. In 7 years it will be 100 years old. Some days I wish it could talk because I can’t even begin to imagine the stories it could tell. 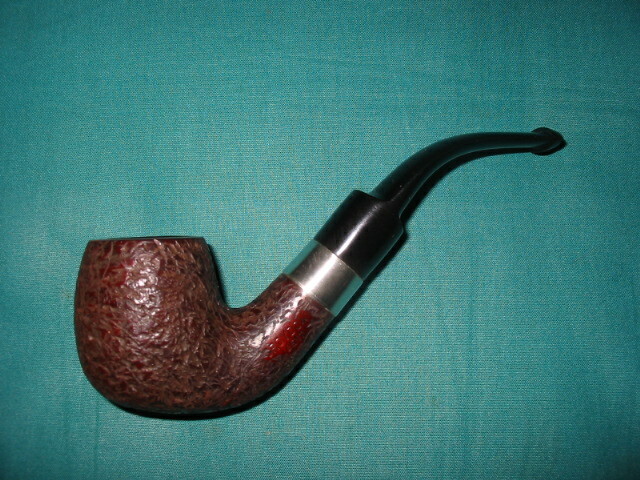 This entry was posted in Pipe Refurbishing Essays and tagged Alcohol bath, BBB Own Make Pipes, BBB pipes, flaming, polishing, polishing stems, reaming a bowl, removing grime with an alcohol bath, removing oxidation from vulcanite stems, removing tars and stains from briar, restaining, restoring briar, sanding, sanding stems, staining, waxing stems on June 14, 2012 by rebornpipes.